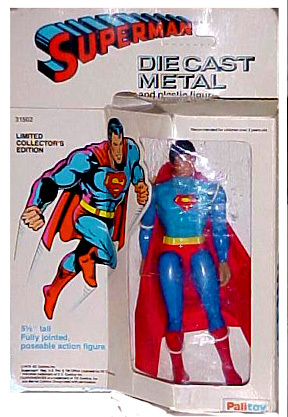 Only the “Big Four” characters were produced for these lines, The Diecast figures seemed to sell well, Mego Packaging for this line has been found from Canada,Italy, the UK and Germany. 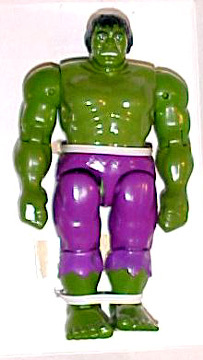 The diecast figures were 5.5 inches tall and were marketed as “Limited edition” no doubt to interest collectors which may have been one of the first times a toy company thought to attract action figure collectors. 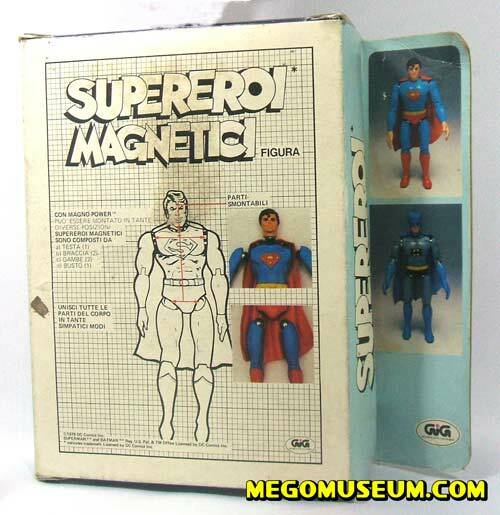 The Magnetic figures were produced in Italy only and released by GIG ( who also did innovative things with Mego lines such as The Black Hole Micronauts and Eagle Force) although a prototype for the US cards has surfaced, Mego had attempted to launch them stateside. 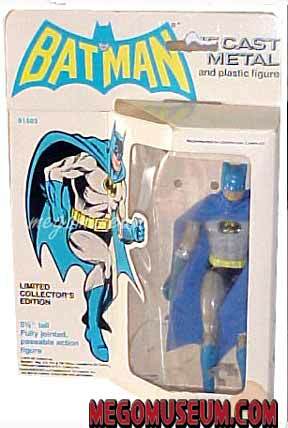 Diecast Batman was available worldwide, released by GIG (Italy), Palitoy (UK) and many more. Above is the US packaging. 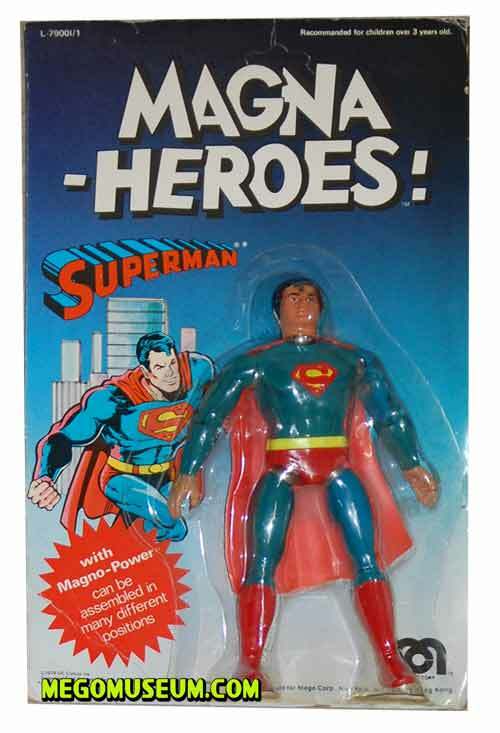 Mego was attempting to cash in on the collectors market by making these figures “Limited editions”. 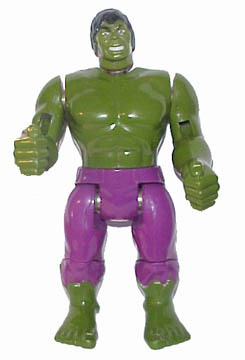 It appears to have had an impact as these figures are often found MIB. 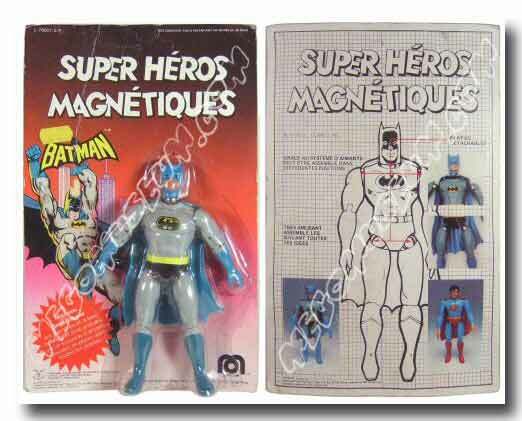 Diecast Batman has a fabric cape but Magnetic Batman has a plastic cape modified from the Micronauts Emperor. 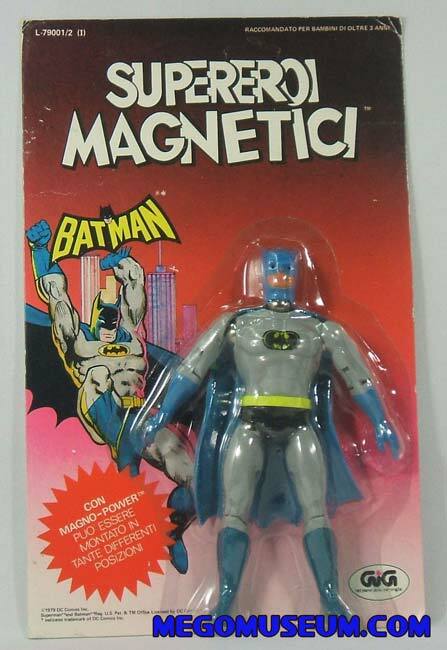 Magnetic Batman was only released in Europe, packaged examples of Magnetic Batman are hard to find. 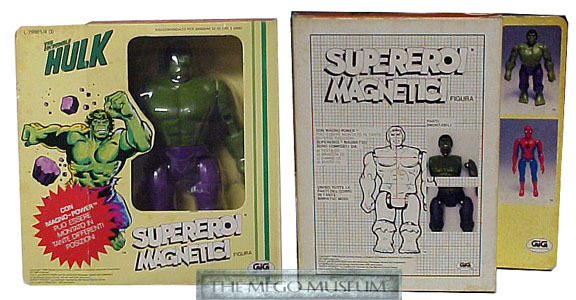 These figures incoporporate the magnetic features from the Mego Micronauts. 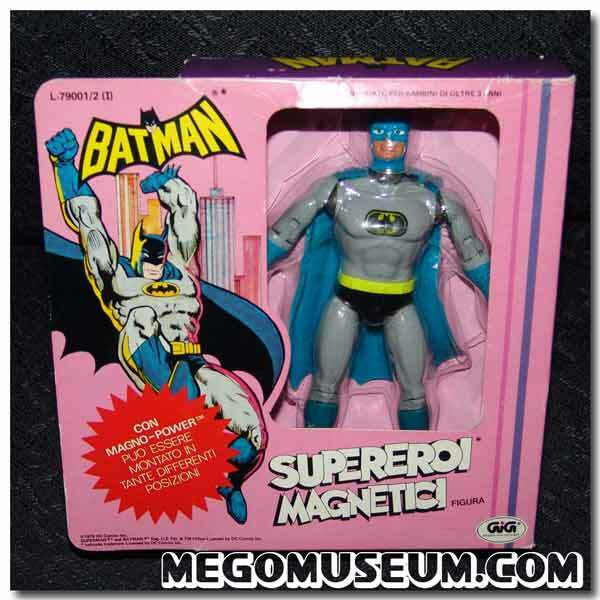 Thanks to Batman collector extraordinaire Rich Hilliard, we have a shot of the difficult to find boxed Magnetic Batman. 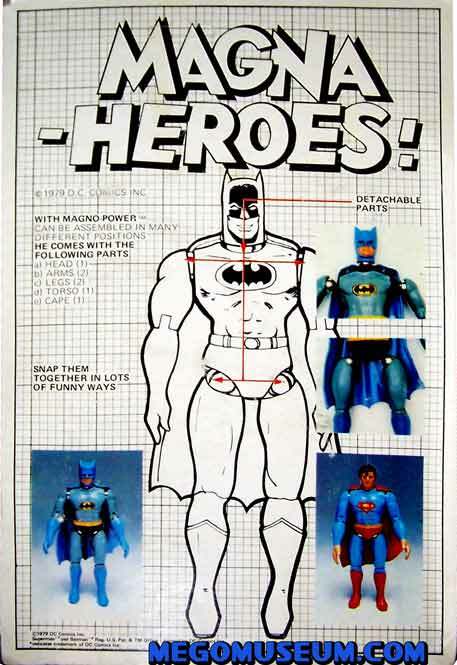 The back of the GIG Batman box. 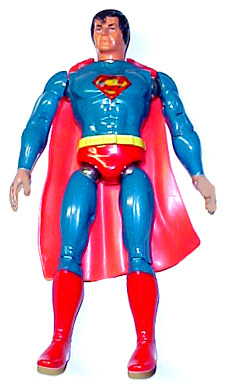 Note the colour scheme for this series is a bit different than conventional Mego product. 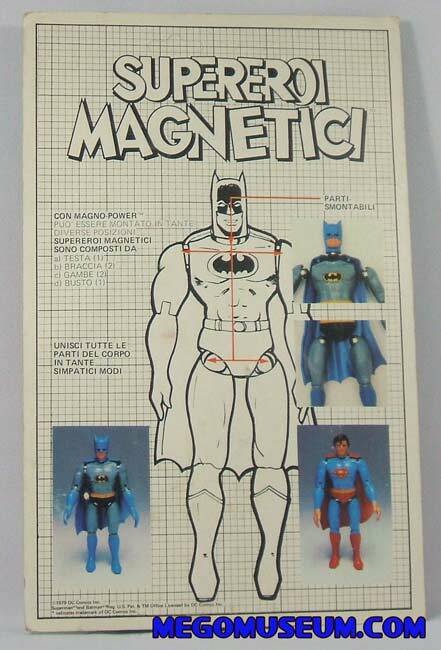 This carded Gig Magnetic Batman uses the same style guide artwork as many later Mego products, carded examples are very uncommon. This is most likely due to these figures being released in limited quantities in France (where they were distributed by Pin Pin) and Italy (by GIG). 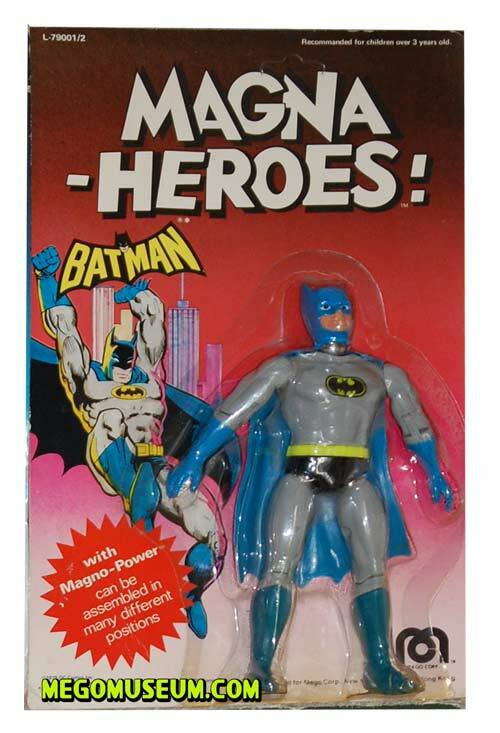 The back of the GIG Carded Batman. 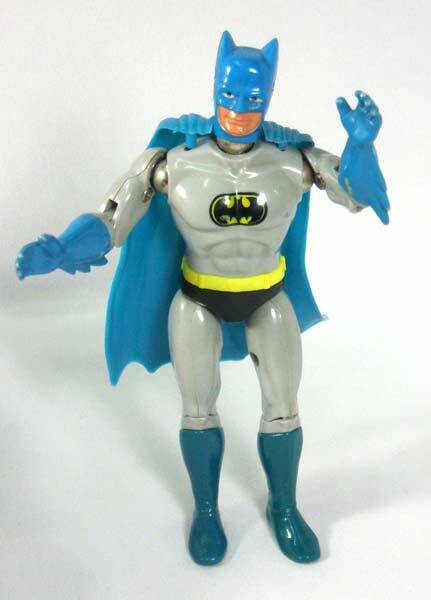 This is the only known example of a US carded diecast Batman and it believed to be some sort of production sample as these figures did not make it to US retail. 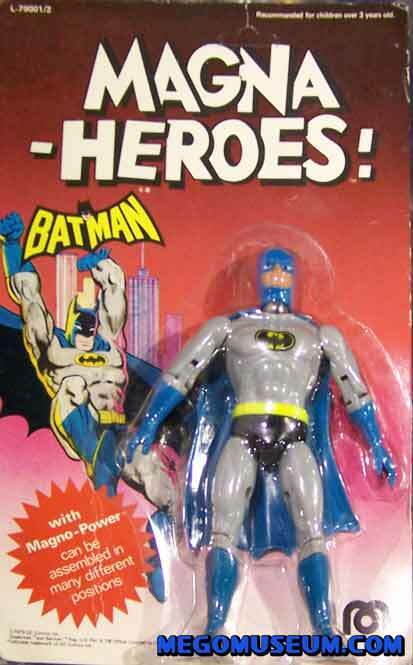 Batman is courtesy of Heroes West Coast. 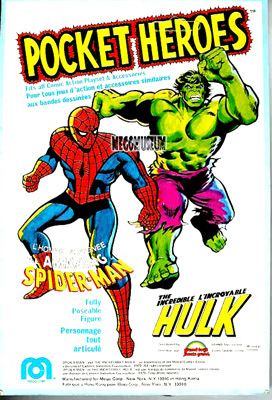 The back of the US carded Batman gives the English version, check the Hulk Gallery for the US proof card. 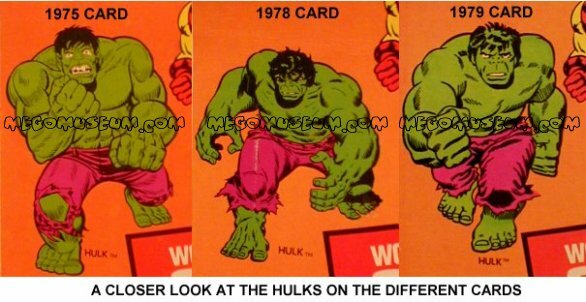 Thanks to Tom L, we know have evidence these figures were released in France by Pin Pin as well. 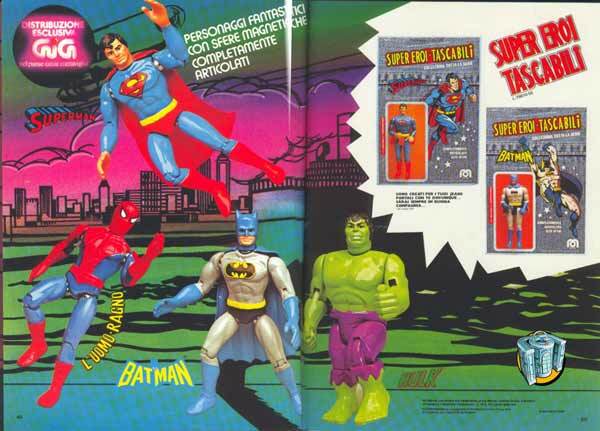 All Die Cast heroes were sold window boxed, the only known variants are the distributor logos on the packaging. 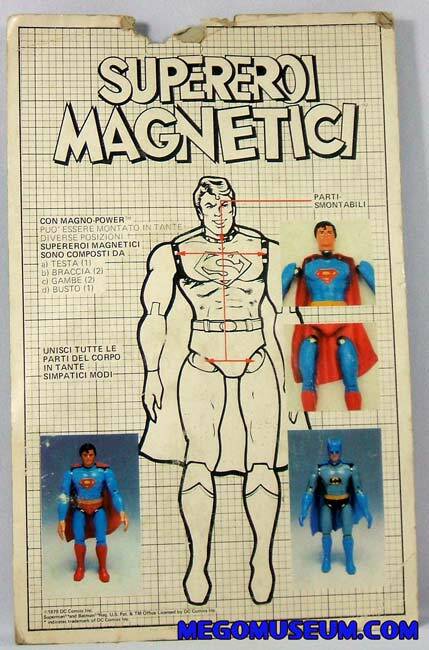 These 7″ tall Magnetic figures were only produced by Gig of Italy and are obvious attempts to cash in on the Micronauts craze. 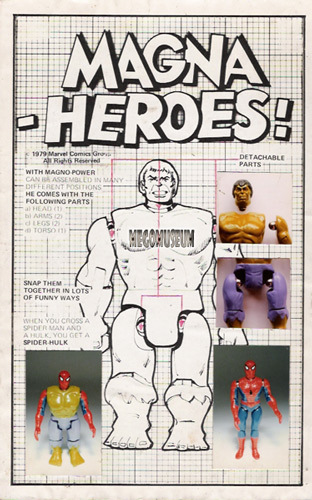 These figures are based on the Magno figures such as Baron Karza and Force Commander, Gig also produced Magno figures of the black hole figures, for futher info please check out The Mego Black Hole Pages . 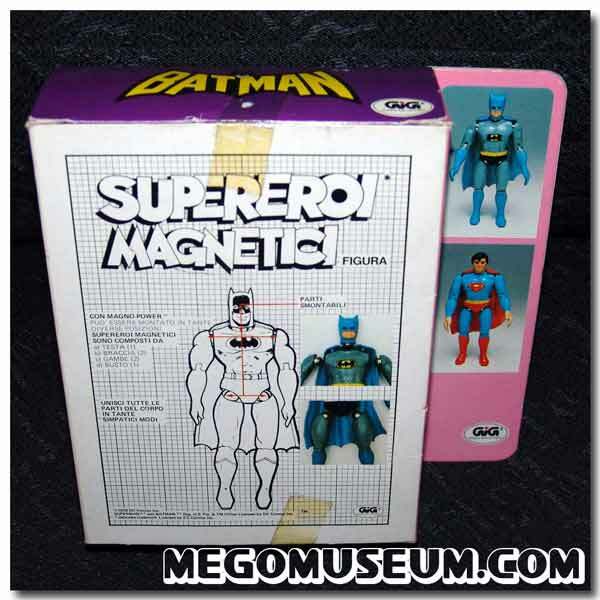 While more commonly found on cards, the Magnetics can be found in boxes as well. 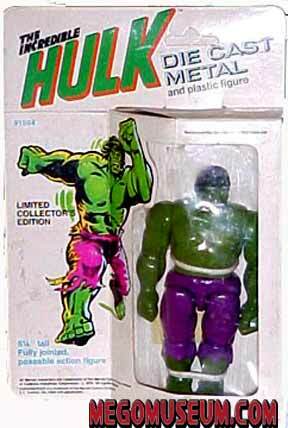 The only known figure to be found boxed is Hulk, perhaps his TV popularity constituted a separate release? 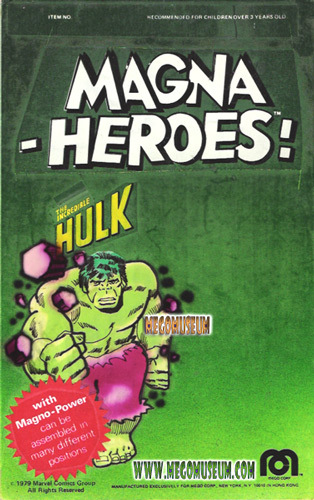 Essentially a pasted together mock up, this card was probably used at toyfair to generate buyer interest states side in the Magna Heroes line. 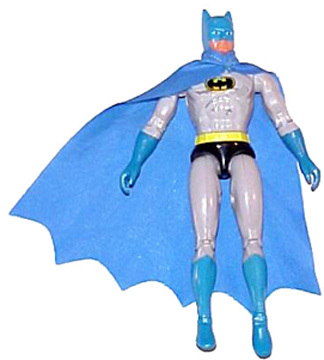 When the toyline was released by Gig in 1980, they used the Neal Adams artwork that also adorned the Diecast heroes and Denim carded Mego pocket heroes. The Backer is a photocopy with the pictures glued on, notice the corrections in red pen. 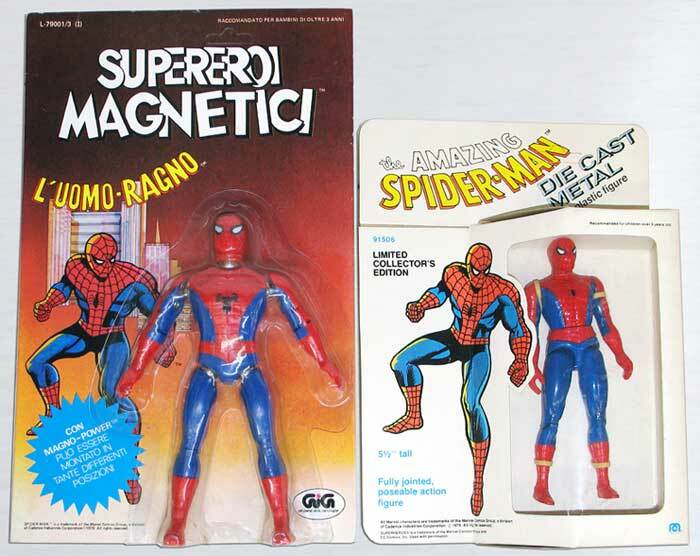 The Mego Magnetic Spider-Man was limited to European only markets and is difficult to find. 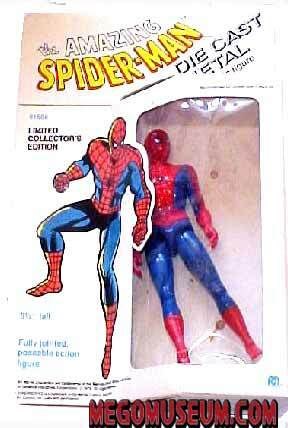 Thanks to Sy, webmaster at the incredible Spicderman Collector we have shots of his GIG Spider-man MOC, very nice! 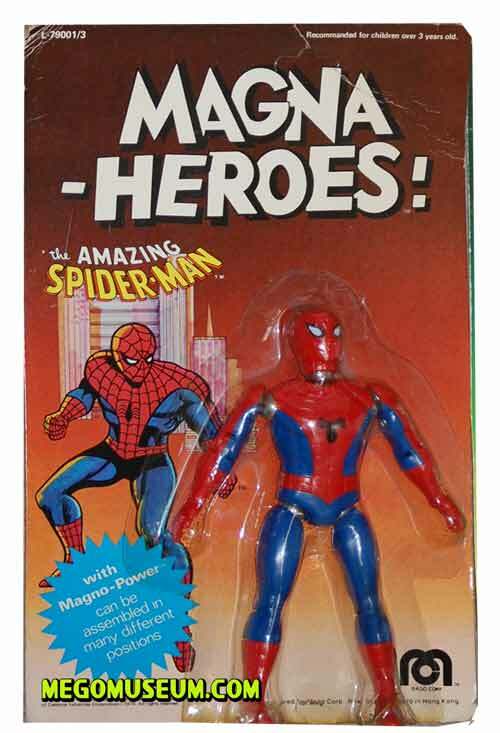 Now if only somebody would unearth a boxed version. 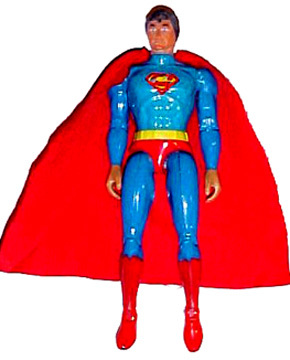 Boxed Mego Die Cast Superman figure, this particular figure bears the Palitoy logo. 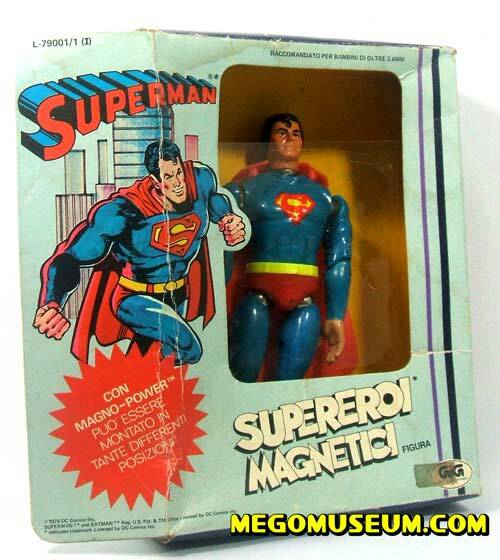 Magnetic Superman was first issued in window boxes, these are extremely rare and the one pictured is the only one that has surfaced in some time. 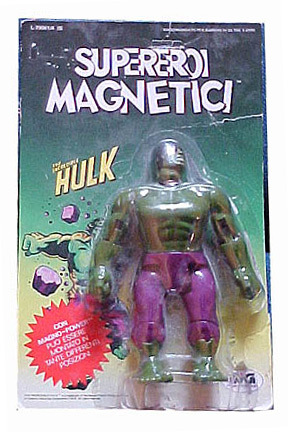 The box has a unique washed out blue for a color scheme, this goes along with the light green of theMagnetic Hulk Box. 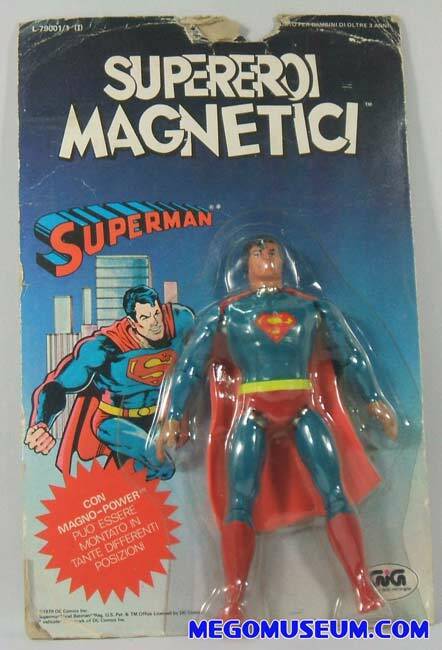 Magnetic Superman was also released in Italy and France on a blister card, which is more commonly found but still by no means easy to find. 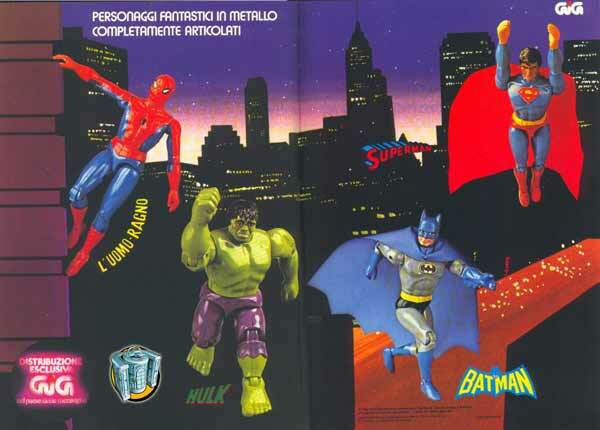 The back of the Italian released card.